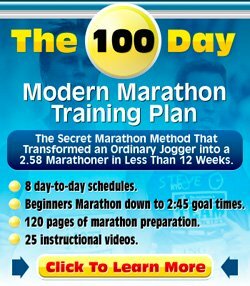 I'm a completely novice runner - I've recently completed a couch-to-30 minutes running program, and have just started your 10k beginner program (completed 1 week so far). I've heard many stories about runners getting injured and was very determined to do everything "by the book" and avoid injury. Everything went ok so far, but this last week I suddenly started expriencing knee pain :(! It's a kind of dull pain around or under the knee cap (it's not very strong, but I feel it most of the time, even hours after my run). I'm really worried that this will force me to quit running. Any suggestions on what to do? Other than the knee pain I didn't find the program too difficult so far. PS - I should note that I am an over pronator (even in every day walking), but I do have proper running shoes and use orthotic insoles. Thanks for your running training question. I am glad you find my site useful. Your knee pain after running sounds like runner's knee. It happens to many runners as they build up their mileage. As you run your knee moves up and down in a little area. If your knee cap doesn't move exactly straight it will scratch the cushioning around it. When you run more and more at some point all that scratching will cause some inflammation and pain. There are different causes for this. Your overpronation is definitely an area of focus and it would not hurt to go to a good running shoe store and get checked out whether your shoes are still doing the proper job for you. Another issue could just be that you have hit a bit of a hurdle at the moment with the build up in mileage that you have been experiencing. Make sure you build up slowly and be not afraid to run a little less or stay steady for a while until your body has gotten used to the new mileage. A third cause could be that your thigh muscles are not strong/supportive enough to keep the knee into place. As you run, you build up your back thigh muscles more than your quads. You might consider doing quad exercises to build up some extra muscle and make the thigh a bit more balanced. So this knee pain after running is a bit of a concern, but not a reason to quit running altogether! You just need to make sure you have got the proper footwear (seems like you do, but make sure your shoes are still fine), build up those quads and make sure your body gets used to the higher mileage. If that means slowing down for a while, then so be it, but definitely make sure that you do not aggravate your knee more and more and more, because you might find yourself in a few months with a chronic injury!